When a body of igneous rock cools, thermal contraction of the rock can generate internal tensile stress that can cause joints to develop. In a large, homogeneous mass of rock, cooling evenly from the top down, the joints can develop repetitively, tessellating the plane normal to the thermal gradient with space-filling shapes such as hexagons, rectangles or parallelograms. This type of columnar jointing becomes exposed when erosion cuts into the body of rock from the side. 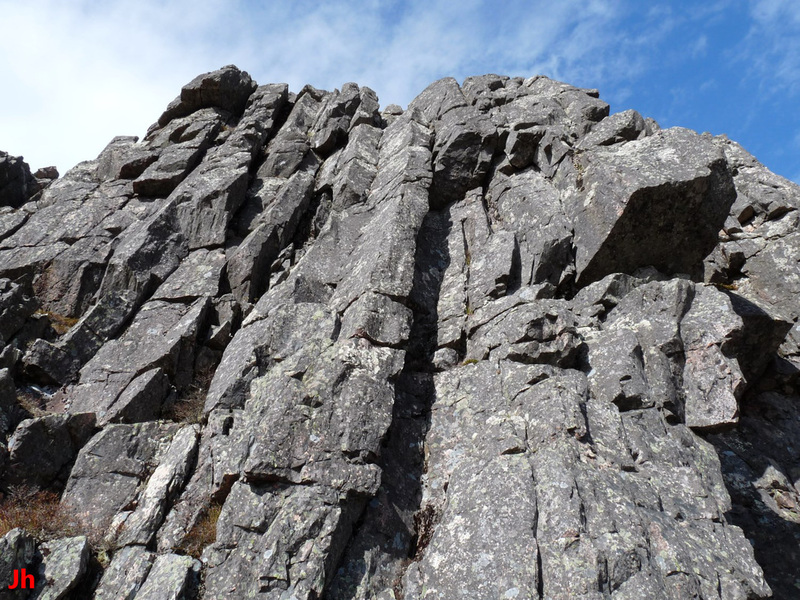 The photo above shows what may be evidence of columnar jointing in a rhyolite cliff (cliff about 15 m high). 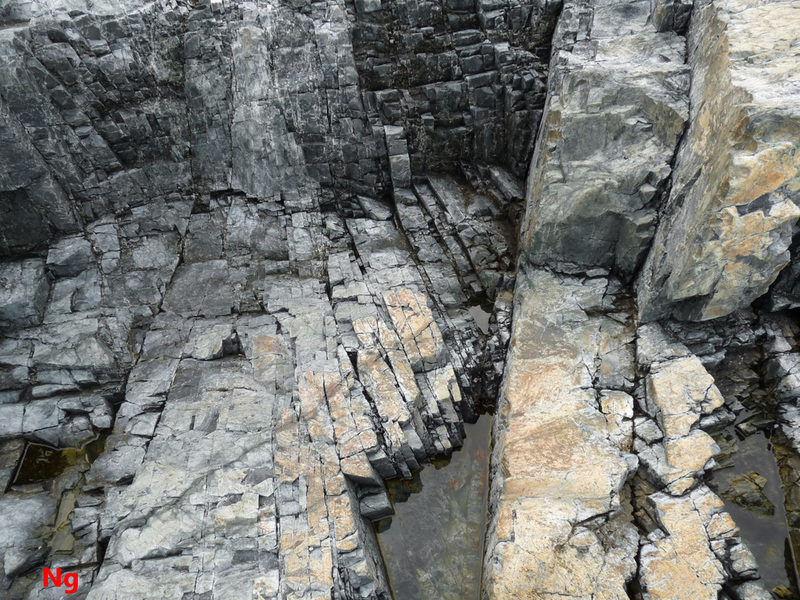 There are few instances of columnar jointing visible in Heart of Avalonia because regional metamorphism tends to introduce new tectonic jointing that masks or obliterates any thermal-contraction jointing that might initially have been present. 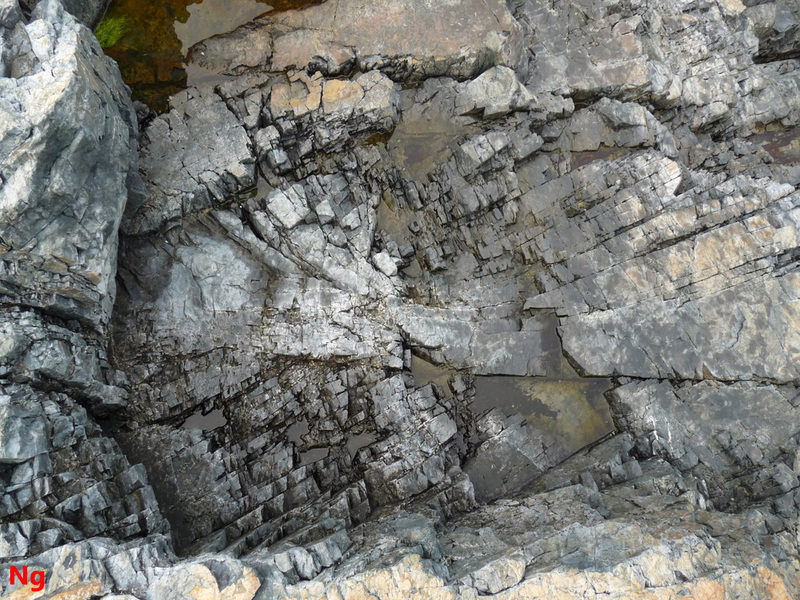 The photos below show details of jointing observed in the above-pictured cliff. 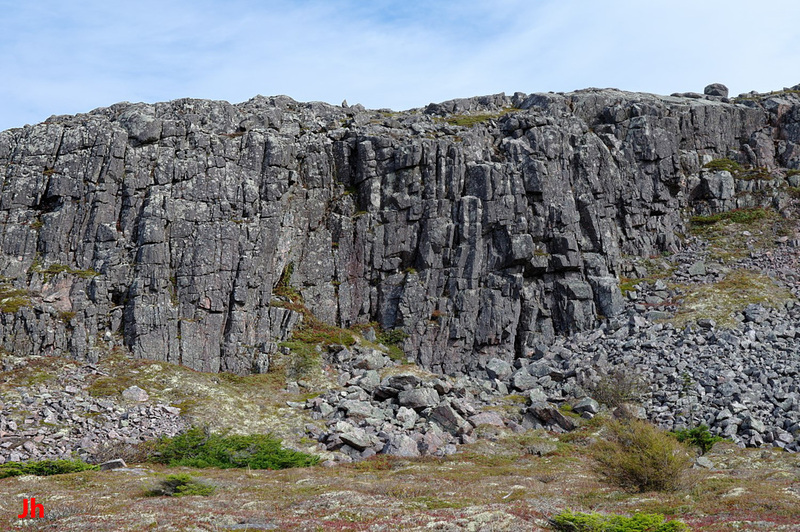 The photo at left shows the full height of the cliff pictured previously, while the right photo shows a small vertical section of pink rhyolite about 40 cm high. In each case, much of the jointing that is visible could be tectonic in origin. Only the multiple different planes of jointing and the overall shape of the patterns of joints suggests that at least some of the jointing originated in thermal contraction. 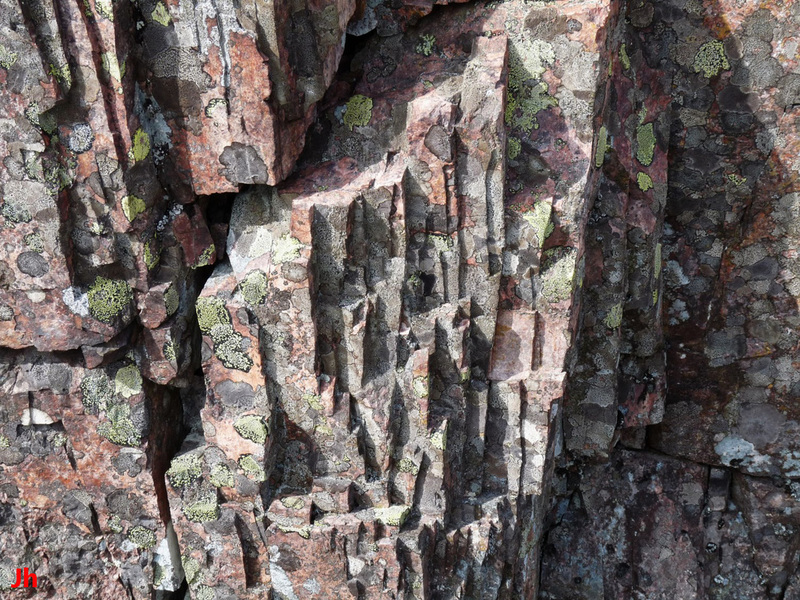 This body of rhyolite extended over a substantial area and apparently resulted from flooding a land surface with lava, making the resulting rock a good candidate for possessing columnar thermal-contraction joints. The above-pictured frost-weathered landscape is the surface of an extensive rhyolite outcrop where thermal-contraction jointing may have played a role in defining the erosion surfaces. The primary indication that the joints and failure planes are not exclusively tectonic is their lack of consistent alignment with the D-H fault direction or any other particular direction. 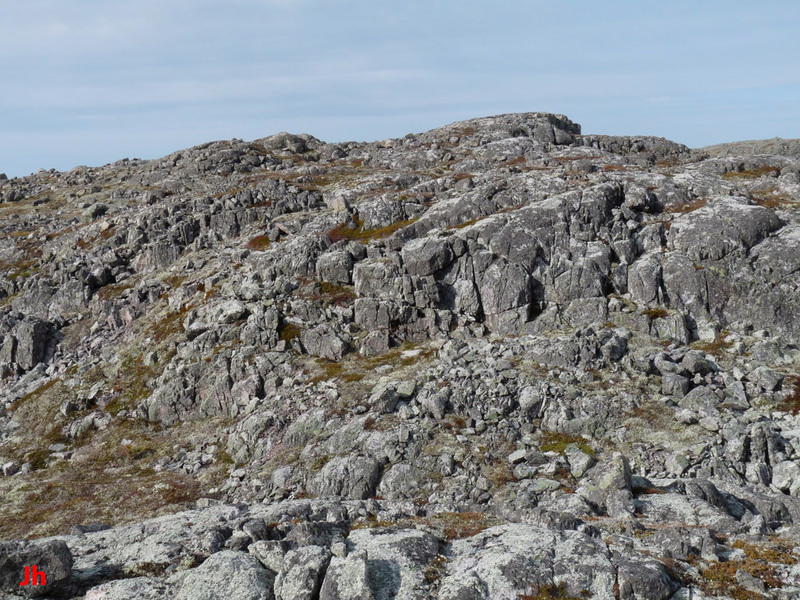 There is no observable tectonic cleavage present in the rocks pictured, this likely stemming from a low abundance of phyllosilicate minerals included in these rocks. The complex joint patterns seen in the above photos (width of view about 2 m in each photo) appear to originate in thermal contraction of the rhyolite that comprises the volcanic bedrock at the location shown. The differing directions of alignment of adjacent sets of joints could have resulted from multiple flows of lava converging into a common area, each flow differing in composition or solidifying and cooling in a different thermal environment. Alternatively, a single flow of lava might have developed the complex thermal-contraction joints as a result of cooling under a highly non-homogeneous thermal gradient. Such a non-uniform gradient would develop when lava cooled in close proximity to water, or under water. Pillow lava structures existing close to the rocks shown above indicate that some of the volcanic activity in this region was taking place beneath water.